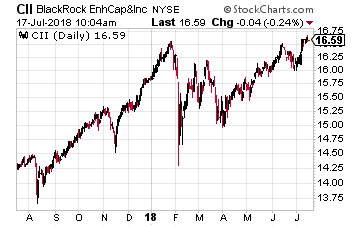 Outside of the FAANG bubble, to date in 2018 the U.S. stock market has trended sideways. As you may be aware, that sideways direction has been punctuated by large daily moves in both directions – up and down. Increased market volatility can produce more attractive return opportunities for covered call option traders. However, you don’t have to be an options trader to get a boost from your income stock portfolio based on the covered call strategy. When you see the financial news media talking about market volatility or the VIX, those metrics are derived from options pricing on the S&P 500. When the market is volatile, option buyers will pay more, and option sellers ask for more to cover the risks of quickly changing share prices. The covered call strategy involves buying shares of a stock and then selling call options backed by the shares. The strategy produces cash income from the call options sales. A cap is put on the upside of potential share price gains, and the options provide a small cushion against a price drop. The covered call strategy is primarily an income producing strategy. You don’t have to become an options trader to benefit from covered call selling. There are about two dozen closed-end funds that employ the strategy. When you invest in one of these CEFs, you will get exposure to the stock portfolio of the fund, plus an attractive dividend yield from the call selling employed by the fund managers. Here are three funds to consider. 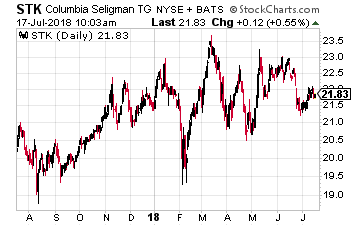 Columbia Seligman Premium Technology Growth Fund (NYSE: STK) seeks capital appreciation through investments in a portfolio of technology related equity securities and current income by employing an option writing strategy. The fund’s investment program will consist primarily of investing in a portfolio of equity securities of technology and technology-related companies as well as writing call options on the NASDAQ 100 Index or its exchange-traded (ETF) fund equivalent on a month-to-month basis. The aggregate notional amount of the call options will typically range from 25% to 90% of the underlying value of the fund’s holdings of common stock. Results have been excellent, with annualized returns of 18.4% and 20.9%, for the last three and five years, respectively. 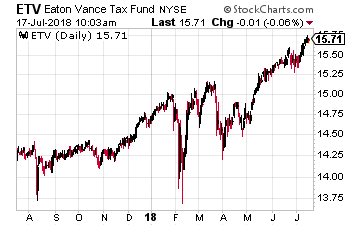 Eaton Vance Tax-Managed Buy-Write Opportunities Fund (NYSE: ETV) invests in a diversified portfolio of common stocks and writes call options on one or more U.S. indices on a substantial portion of the value of its common stock portfolio to generate current earnings from the option premium. Buy-Write is another name for covered call writing. Also, as the fund name states, the managers strive to generate the best after tax returns. The fund uses the S&P 500 stock index as its benchmark evaluate returns. Three and five year average annual returns have been 11.0% and 13.25 percent respectively. To show that different managers will have their day, ETV is up 6.9% year to date, while STK has gained just 3.2%. ETV pays monthly dividends and currently yields 8.5%. BlackRock Enhanced Capital & Income Fund (NYSE: CII) seeks to achieve its investment objective by investing in a portfolio of equity securities of U.S. and foreign issuers. The fund also employs a strategy of selling call and put options. While the other two funds use index or ETF options for income, the BlackRock managers employ the writing of single stock options. Selling puts is a comparable strategy that can at times produce better returns compared to selling calls. Three and five year annual returns for CII were 11.9% and 13.8%, respectively. The fund is up 5.25% year to date. CII pays monthly dividends and yields 6.0%. "I just wanted to thank you for the excellent advisory service that you provide. In 3 months I have collected $8,284 in dividends from my investments. In less than 6 months, I have put together a portfolio that will generate $36,000 per year for the rest of my life. Your system really does work and once I had demonstrated that to myself, I purchased your service for life! It is nice to actually come across something that really does work and perhaps more importantly, doesn't make outrageous promises that can't be kept! Thanks again! Click here to discover how you can get your retirement income plan on track just like Brad did.